Tuesday afternoon I was sitting at my desk at work, minding my own business, when the stomach gremlins marched in and punched me in the gut. Apparently there’s been a bug going around the school system and I picked it up from a kid that I babysit for. Luckily, it was a fairly quick virus but I was down for the count for a few days. Between a week of late nights at work not ending until 10:30pm or so and the fact that looking at and smelling food was pretty much repulsive to me, Braise The Roof has been neglected this past week. Writing about the one banana and piece of toast I was able to choke down in the first two days of coming down with the plague probably wouldn’t have interested anyone. Together, my mom and I put together our Thanksgiving menu yesterday! We wrote down a bunch of dishes from each of these categories: appetizers, vegetables, starches, desserts. Assuming we’re having the same turkey, gravy and stuffing that we always have (it’s tradition, why change it? ), these categories pretty much cover everything else. My parents will be hosting about 10 grown ups and 2 munchkins (ie, my nephews) so we narrowed down the list to decide which dishes we’ll actually make (about 3 from each category) and then I made a detailed grocery list so that no one has to rush to the grocery store 5 minutes before it closes on Thanksgiving day. Which will probably happen anyway. Are you the Thanksgiving planner in your family? Am I totally over-zealous?? Now that my stomach is finally feeling back to normal, I’m going to eat everything in my kitchen. It’s been a while. This is our first year hosting and I have gone over the list a million times! I’m glad you are feeling better! I’ve never been in charge of Thanksgiving, I usually just bring a dessert (sweet potato pie baby)! I’m only making two things and it’s amazing how much grocery shopping I had to do! Ridiculous! That list is amazing. 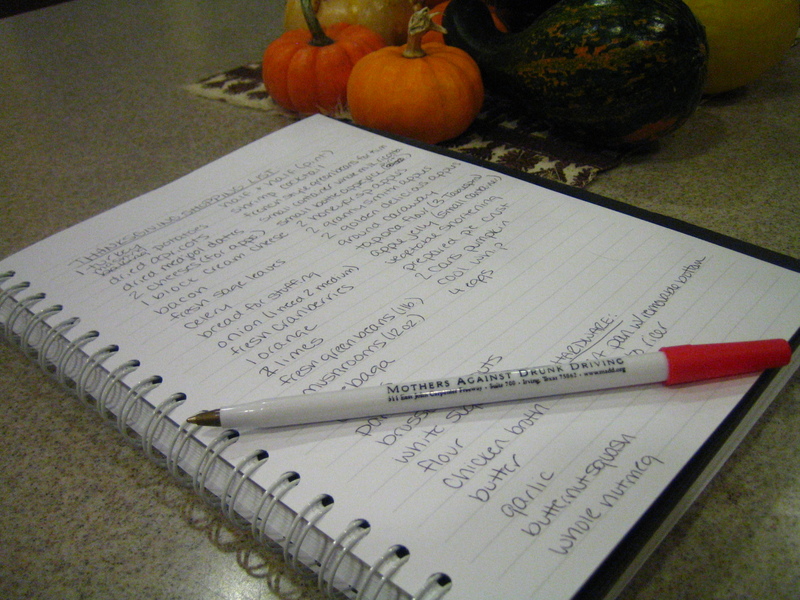 I am not hosting Thanksgiving, but beware…when Christmas rolls around, things get ugly and the lists start accumulating. I’ve never been able to avoid the 17 last minute trips to the store though. Good luck!